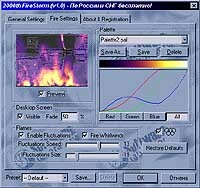 FireStorm screensaver - Burn your screen in amazing flames! Incredible realistic fire screen saver. Official author's website. The fire usually attracts attention of the human eye. Everyone can�remember the moments of sitting in the dark and watching the fire. It could be the best pleasure for a workingman to stay for a while�recalling that sense. Fire Storm Screensaver animates a highly realistic fire imitation�with sparks, clouds and fireballs on the computer screen. The saver has a wide customization range with different additional effects�available. In this Christmas Edition there is a new effect of the�burning "2003" digits which are slowly appear on the screen and�then turns into "2004" with a last zero's blast and finally explode�into dozens of wonderful fireworks! "Happy New Year" spectacle effect specially for 2004! Advanced fire-generation algorithm with incredible flame whirlwinds. Visual palette editor. Now you can use many color palettes and create or edit your own. Explosion blasts sounds in addition to burning fire noise. A lot of user-editable properties are available in complex settings dialog. You can create & save your own fire themes using embedded profile editor.